Productions — Karma Dance Inc.
Premiered in Melbourne in a sell-out season, and subsequently toured to Auckland. Live dance, music and film come together in a rare and intimate stage documentary on classical Indian dance. An exploration of the various ideas of the maternal energy across cultures: mother earth, mother tongue, mother country, god as mother. A classical and contemporary expression of the literature and vision of Indian Poet - Rabindranath Tagore. A multi art-form full-length production in the dance styles of Bharatanatyam, Mohiniyattam and Kuchipudi. 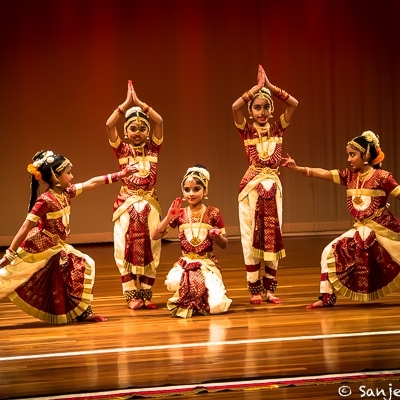 "Sanmaargam" (in sanskrit)- reflects the idea that dance is a journey of personal character development beyond just the movement of hands & legs. It is a journey of the mind, the soul, the heart. As students of the Karma Dance academy perform, each item will showcase a different personal value/principle which the students have learnt about in class and will contemplate as they perform. Classical Indian dance, music and documentary film come together to tell the fascinating story of classical Indian dance over the centuries. A tri-coloured expression through dance and live music, of the symbolism behind the Indian flag. Hosted by the Laya Vidhya Centre, Melbourne.